Ramblings from an Over-Squozen Brain: Half My Life! Twenty-two years ago today I woke up in a cheap motel in a sleepy Mexican town somewhere around Tampico. I had driven all day the day before from south Mexico, stopping every half hour or so to add oil - the engine my truck was in desperate need of some serious mechanical attention. I was on my way to the states to overhaul the engine ... and to get married (although I didn't know it at the time)! By the end of the day I had tied the knot with the most beautiful woman on the face of the earth - Lori Marie Chapman! You can read the story of how we got married on my of my websites at: http://www.GuardHerHeart.com/HowWeGotMarried.shtml. Yes, it's a crazy story, one I probably wouldn't believe if someone told me it happened to them. But that is what happened 22 years ago today! 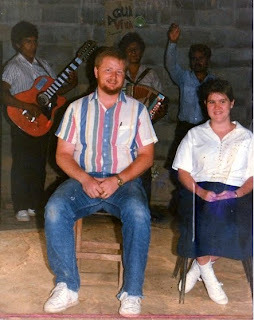 Lori left a comfortable life in the United States to join me as a missionary to Mexico. We lived in a tiny one-room (not one-BEDroom, one ROOM) apartment and she was a real trooper! (We did eventually move to something bigger!) Over the next 3 1/2 years we helped establish and oversee churches in the state of Oaxaca and later helped plant a large congregation in the city of Coatzacoalcos, Veracruz with Joel and Angel Dyke. Lori learned Spanish the hard way - going to the market, sitting through church services, conversing with neighbors. She jumped in with both feet and truly made us a home in the heat of those southern jungles, an oasis of love on foreign land. As I think back over the last 22 years of our life together, there have been a lot of changes, a lot of laughter, a few tears and a lot of growth. We have grown in our love and respect for one another. We have learned to give each other space and be gracious with each others' flaws and shortcomings. (She's had to be more gracious than me! ) I can truly say that our marriage is stronger and more fulfilling now than its ever been. Both of us are 44 now, which means we've now been married for half of our lives. In looking back, I have to admire that young lady who left a life of ease and comfort to join me in the unknown world of missions and life in general. It's been quite an adventure! And she has loved me, believed in me, encouraged me ... every step of the way. Thank you, Lori, for spending half your life with me. I look forward to spending the rest of our lives together. I love you! I love serving Jesus with YOU, Lori Marie Chapman Martin!